“Life with a narcissistic manager” should be prescribed text…. …for business leaders. 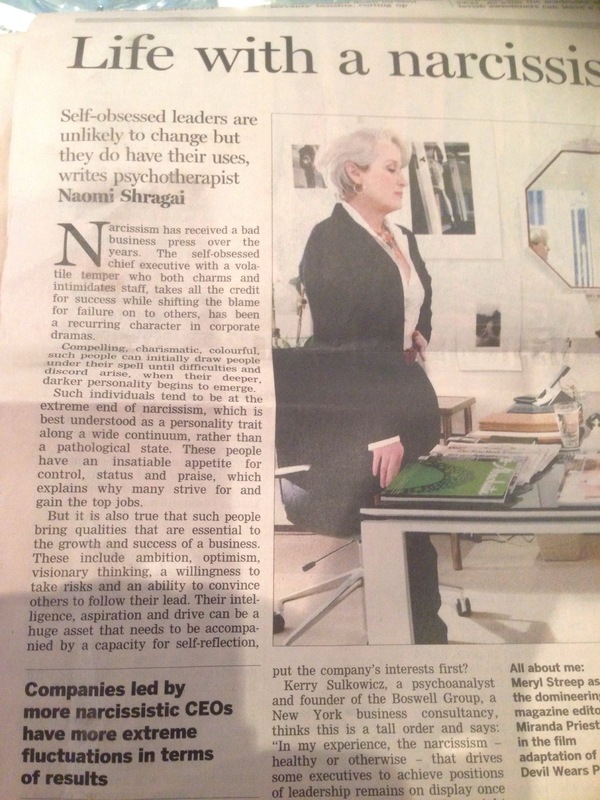 It’s an article in yesterday’s FT by psychotherapist Naomi Shragai. She explains how “more narcissistic CEOs have more extreme fluctuations in terms of results” but also how their “need for affirmation may be driven by an unconscious attempt to repair earlier traumatic experiences” and she gave an example of one entrepreneur who, once he understood his past and his reaction to it “he was able to work more collaboratively with his staff and learn to tolerate his own experiences and feelings”. If this is possible, and I believe it is, then psychotherapy for business leaders could, unthinkable only a few years ago, become part of their remuneration package with a clear ROI, based on the research. Posted on October 30, 2013 by Ciaran Fenton. Bookmark the permalink.